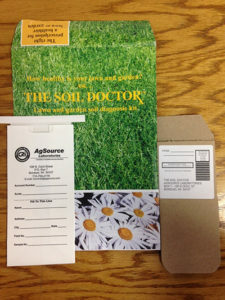 The Soil Doctor – Lawn & Garden Soil Diagnosis Available at the SWCD Office! The right prescription for a healthier lawn or garden! Pick up your free kit at the Stephenson Co. SWCD office. Instructions and box are in the kit. Take a sample of the soil in your yard or garden; prices start at $18 for the basic package. The Soil Doctor checks your lawn or garden for: Soil PH, Potassium, Phosphorus and prescribes fertilizer to match your needs for lime, phosphorus, potassium and nitrogen. Follow the sampling instructions included in the kit and send it into The Soil Doctor for laboratory soil analysis. A detailed report will be mailed to you promptly.